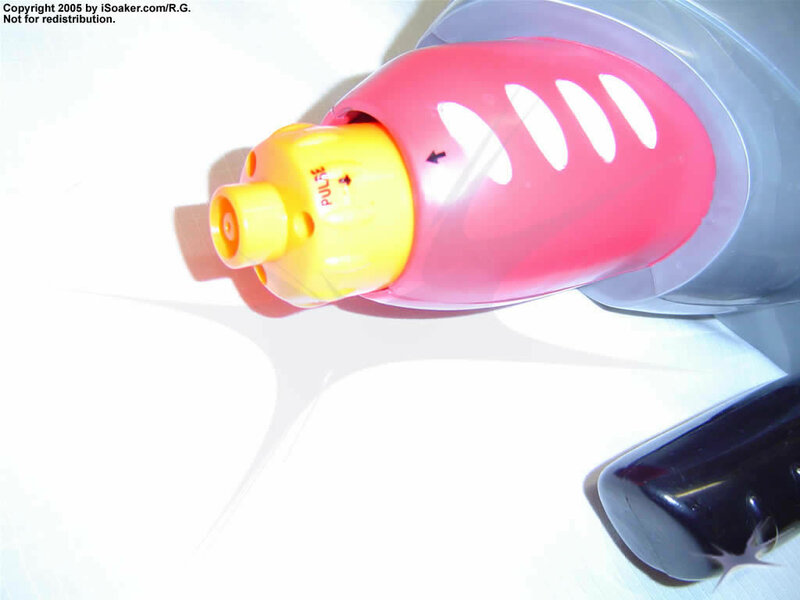 The Super Soaker EES Turbine is the largest of the EES Super Soaker series. EES is an acronym for Enhanced Electronic Soakage. The electronic part of the equation has nothing to do with its water blaster function and is purely cosmetic. The electronic lights and sounds are activated when the trigger is pulled, but can be turned off by setting the three way power switch. The switch has two other settings: On and Demo. While in the store, the switch is set on demo in order to allow people to test out the EES features, but without overly draining the battery supply. In the "On" mode, the lights, sounds, and spinning motor remain active as long as one depresses the trigger. This makes the soaker vibrate slightly, but does not appear to enhance the actual performance in any way. 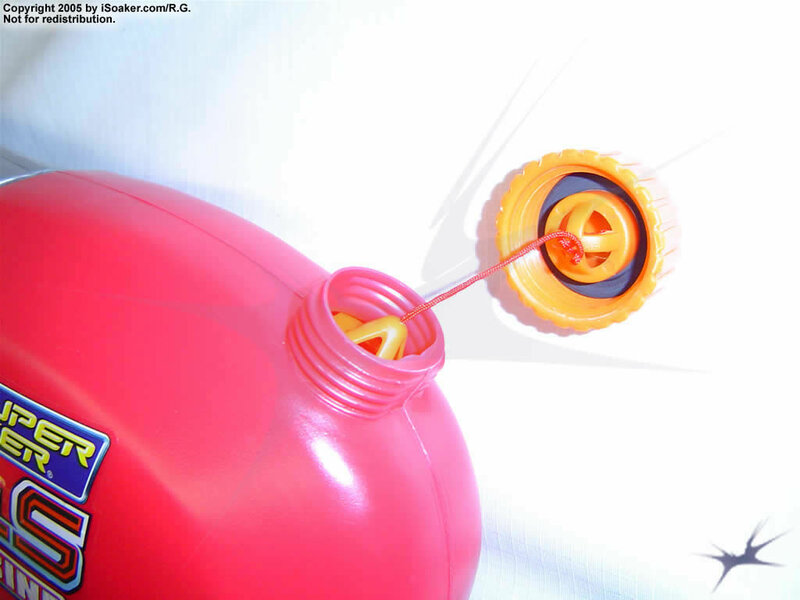 The Super Soaker EES Turbine requires 3 AA batteries for its lights, sounds, and motion (the reddish-turbine screw area housed in the clear plastic shell spins and lights up when activated). The battery cover is attached to the soaker housing using two screws and has a rubber seal running around the edge of the cover. The size of the EES Turbine is just a touch smaller than the Super Soaker CPS 2100. However, it only carries roughly half the payload in its reservoir and has no separate firing chamber. Instead, the EES Turbine relies on the pressurized reservoir system to provide the pressure to push water out its nozzle. There is an intake hose within the reservoir that is reminiscent of the Classic Series intakes (no weight to keep the end of the intake nearer to the bottom of the reservoir). The problem here is that if one is not careful with how one is holding the blaster with respect to the ground, one will end up doing mist shots even if the reservoir is still quite full. On a better note, the EES Turbine has two nozzle settings: Stream and Pulse. On stream setting, the blaster performs slightly sub-par for a soaker of its size. The stream feels like and more or less equals the output of the XP70. Shot time is a little longer as the EES Turbine draws water directly from its reservoir. On pulse, the blaster performs a little better. Unlike the Super Soaker XP 90: Pulse Fire's pulse setting, the EES Turbine's pulse stream seems stronger and the pulses feel more controlled. Due to the nature of the pressure system, pulse setting appears to be the best setting for this soaker to be on as it both conserves water use and lengthens shot time without significantly taking away from its power. As has been found during range testing, the pulse setting does indeed fire further than the stream setting. The trigger/nozzle mechanism feels as if it is the same as used on the Max-D line. 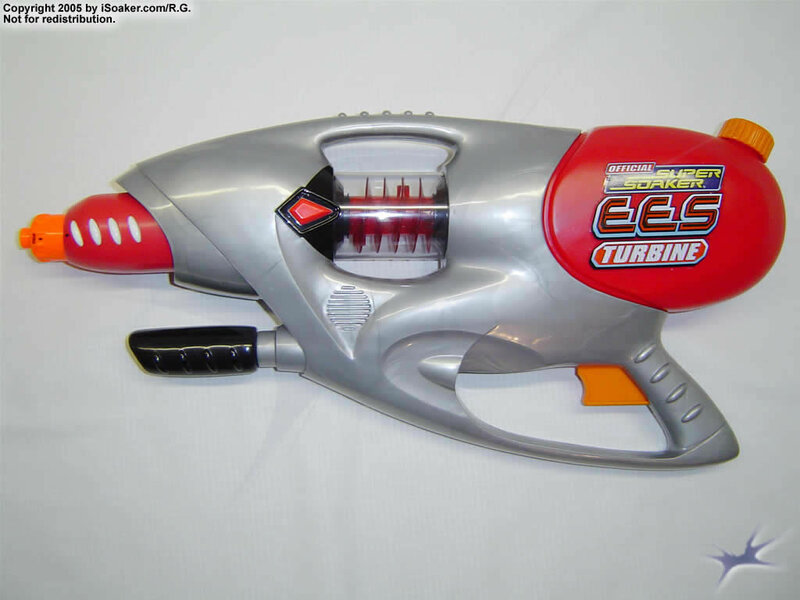 However, unlike other Max-D blasters, the stream produced by the EES Turbine lacks the same punch. While on the larger side, the Super Soaker EES Turbine would be classified only as a light assault soaker. Its limited payload, lack of firing chamber, and sub-par performance for a blaster of its size all contribute to a diminished rating. The novelty of the light and sound effects does not last long, serving no purpose during actual water combat. If this is your primary blaster, be wary of anything larger than a Super Soaker XP 270 or Super Soaker Max-D 5000. Good feel to the construction, nice colouring, pulse setting to conserve water. Trigger-grip region has a good feel (though a little small for large hands) and it is simple to switch between pulse and stream shots. Lights/motion/sound effects do not server any real function (lights too small and not positioned in such a way to be useful during night fights). Does not have a separate pressure chamber. Can be out-classed by any soaker larger than a Super Soaker Max-D 5000. I just bought my EES Turbine today and though the thought of electricity makes you think it is better, it is about the same as any other gun. I have found that the on position of the three way switch for the lights and sounds keeps the gun's lights going on seemingly forever unless you turn it off (snipers: beware if you use this gun in sniping. check to make sure it is off). I have found that the pulse setting is much better at water output than the stream setting. I have found it is hard for little kids to pump it even though the recommended age group is even younger than that. I would recommend this for sniping if the lights are off because of the pulse setting sends the water quick enough and it's hard to trace. Well, that's my review.